My first visit to Graceland was over thirty years ago. My sister and I were driving up through the Delta in the middle of a heatwave in my little un-air conditioned Datsun, and she was, I must say, tad tetchy. We had been in Greenville, Mississippi where it was 100 degrees at ten o’clock at night, and during the day the heat from the parking lot radiated up one’s legs and lingered, oh, about knee high. It was an awful sensation and scary. I had never experienced such a thing. While we weren’t at each other’s throats, we were soon about to be, so in the spirit of detente, we agreed to take the Memphis exit and go visit The King. Memphis in the middle of the summer is a hot and sweaty place, and this was an exceptionally hot and sweaty day. In line with us was a young couple from Scotland, very fair, very red in the face, fanning themselves feverishly, with the look of the doomed about their eyes. Scotland, remember, is a land of summers in the sixties, with heat waves topping out about 76 degrees Fahrenheit. I thought it possible we might lose them altogether, and they were sweet, too. Looked like newlyweds, maybe. They rallied, though, as they linked arms and half-swooned, half-dragged themselves to the front door. They were, after all, on a pilgrimage, and that requires sacrifice and discomfort and pain. They had come to give homage to Elvis. The King. Not much has changed at Graceland in thirty years, at least not Graceland itself. I discovered this back in June when my pal, Alice, and I took her two granddaughters on a pilgrimage of our own. We talked about taking the girls last summer and it didn’t work out, so this year we got it on our calendars early. We packed the car with iPads and pillows and took off early one Wednesday morning, the day already hot and humid, as it should be. The girls giggled in the back, sometimes erupting in outrageous laughter at things only eleven-year olds find funny. 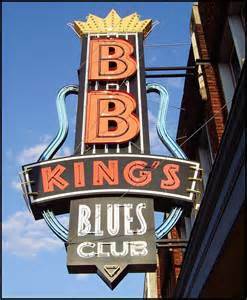 We arrived in late afternoon, too late to tour Mud Island, so we decided to hit Beale Street instead. How to describe it? Perhaps a PG-rated Bourbon Street, but it also reminded me a little of Broadway in Nashville, but more cramped, with tiny shops stuffed to the gills with Elvis and blues memorabilia–shot glasses, trinkets, caps, t-shirts and ties. Just store upon store, and tourists everywhere. Where else but on Beale Street can one score a Bessie Smith postcard as I did? Nowhere else, I tell ya. While I took pictures of a metal studded bra through the window of a shop, Alice and the girls wandered down Beale, goofing around with the street performers who paint themselves all in silver paint, stand on boxes and act like statues. Oh, but I never tire of that spectacle. Mercifully, the girls were ready to go back to the hotel and swim, and I was all for that, knowing we had a big day tomorrow. How to describe Graceland, the house? I really like it. There. I’ve said it and I am not apologetic for it. The joke is to hate it, talk about how tacky it is, and to roll your eyes a little, an indication of your superiority and good taste. Of course it is dated, stuck in an early sixties decor, but even thirty years ago Kathy and I agreed that it had a livable look to it, not our style, perhaps, but comfy in its way. Human-scaled, humble. A house for having friends over to hang out. 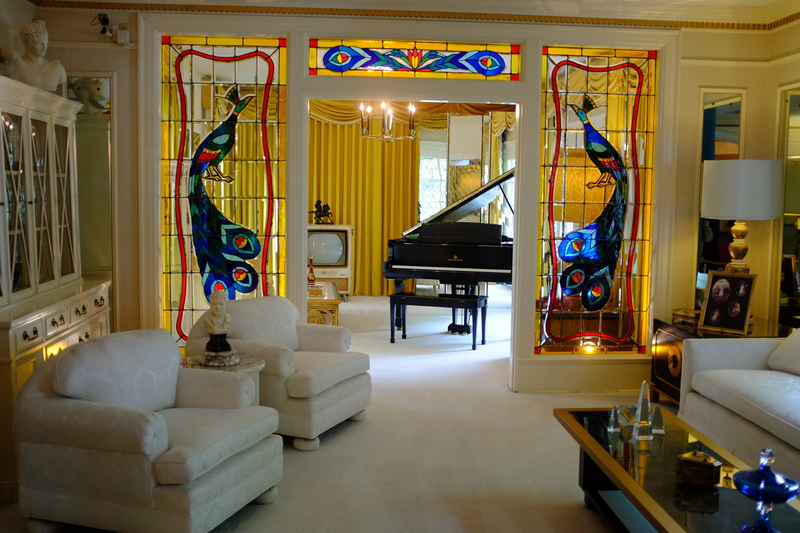 What strikes you about Graceland, besides the modest proportion of the house itself, is the near-reverence of the tourists churning through it. It is quiet. People talk in hushed tones, not like church, but respectful. 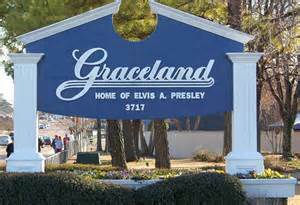 I think it is because Graceland really was his home. It doesn’t take long to view the house, and then you are in the memorial garden, moving toward the horseshoe of ground where Elvis, his stillborn twin, his mother, father and grandmother are buried. It’s quiet here, too, out in the sunshine, and the girls are quiet. Thereare still airplanes to tour, fancy cars to ogle, and t-shirts to buy. A museum to tour with his hundreds of gold and platinum records, his Vegas costumes. But for a moment, we stand at his grave and think about Elvis. Even the eleven-year olds.